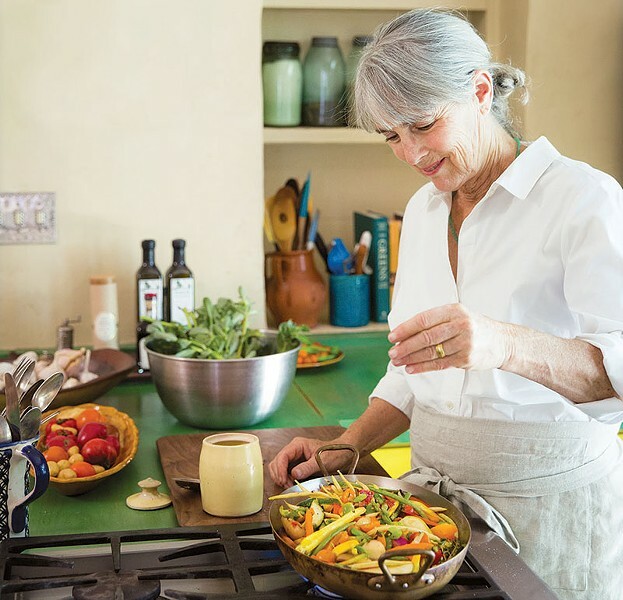 Dinners to Die For with Ann Cleeves happens Friday, April 21, and Dinner with Deborah Madison happens Thursday, April 27, at the Spinster Sisters, 401 South A St., Santa Rosa. $105–$170 per couple. Register at copperfieldsbooks.com and bookpassage.com, respectively. VEG ED Vegetarian cooking doyenne Deborah Madison appears at one of the Spinster Sisters’ author events this month. Located in the heart of Santa Rosa's South of A arts district, the Spinster Sisters is a culinary destination that bolsters the artsy neighborhood with creative and delicious locally sourced menus. Bohemian's Best Of 2017 readers poll—is also making a name for its food-friendly literary events. This month, the Spinster Sisters hosts two literary dinners. First, acclaimed British mystery writer Ann Cleeves reads from her new novel, Cold Earth: A Shetland Island Mystery, in a Dinners to Die For event co-hosted with Copperfield's Books on April 21. The following week, famed vegetarian chef and author Deborah Madison is on hand to showcase her new book, In My Kitchen: A Collection of New and Favorite Vegetarian Recipes. The dinner is a Cooks with Books event co-presented with Book Passage on April 27. "We're interested in doing more community-oriented events, not necessarily all food-related events," says Spinster Sisters general manager Ela Jean Beedle. The restaurant has already hosted events with Book Passage and recently reached out to Copperfield's Books to collaborate with the North Bay bookseller. "For our author dinners, we include a three-course meal, and in the case of any cookbook events, the menu is inspired directly from the books," Beedle says. For Madison's appearance on April 27, the restaurant is preparing a three-course vegetarian meal using recipes from In My Kitchen, such as an artichoke scallion sauté and blood-orange almond cake. For Cleeves, the restaurant is going to take a more creative angle that will draw inspiration from both the novel's United Kingdom location and mysterious subject matter. Cold Earth is the latest in Cleeves' ongoing Shetland Island Mystery series, now a British television drama. Following inspector Jimmy Perez, the series is praised internationally for Cleeves' clever plots, witty dialogue and evocative action. For the upcoming readings, the Spinster Sisters offers a family-style dining experience. "We want to encourage conversation," says Beedle. "We sell a lot of single tickets, and people may not know those they sit next to. That family-style experience opens people up." The tickets to these events are limited at only 65 seats, though if you get your hands on one, it is an all-inclusive package that includes dining, wine pairings and a signed copy of the book. Along with the casual atmosphere, these events are a way for literary fans to meet their favorite authors. "We let the author decide how they want to do it," Beedle says. "Some will read excerpts, some will talk and tell their story about what inspired them." "I feel like this is an awesome opportunity to meet people you have a common interest with, and get an intimate, interactive experience over a great meal," Beedle says. "And it's a chance to meet these authors that are really inspiring characters."